Volunteers are needed on Acadia’s trails and carriage roads. Come for a morning, a season, or a lifetime! All are welcome and no experience is necessary. It’s not only important . . . it’s fun! 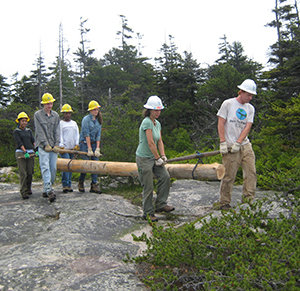 WHAT: Volunteers assist with many projects in Acadia National Park, like cutting back vegetation along the trails and carriage roads, rebuilding small rock retaining walls, maintaining and rehabilitating hiking trails, maintaining historic vistas, and cleaning up at picnic and scenic areas. Check the upcoming project schedule! HOW: Staff and volunteers will greet you on the front lawn of ANP Headquarters. They will provide you with tools, gloves, training, and transportation to the work site for the morning’s project. WHAT TO BRING & CLOTHING: Water, snack/lunch, and insect repellent. Dress in layers for variable Maine weather, and wear sturdy shoes (no sandals or exposed toes). Ticks carrying Lyme disease are very common in Maine. We recommend wearing long socks and light colored pants, which you can tuck into your socks, to prevent ticks from climbing under your clothing. CONTACT FOR MORE INFORMATION: Dana Petersen at 207-288-3934 or dana@friendsofacadia.org Dana is the Friends of Acadia Stewardship Coordinator. GROUPS: If you are a group with more than 5 volunteers, please contact the Stewardship Coordinator, Dana Petersen at 207-288-3934 or dana@friendsofacadia.org beforehand to help plan appropriate projects. For large groups, special work projects can be scheduled for Monday, Wednesday, or Friday. SCHOODIC: For seasonal volunteer opportunities at the Schoodic Peninsula in Acadia National Park, please contact the Acadia National Park Volunteer Coordinator, Dianna McKeage: 207-288-8716 or dianna_mckeage@nps.gov Please note that Dianna is furloughed for 3 months during the winter.